DataSet and DataView. A flexible key/value based data set. Add, update, and remove items. Subscribe on changes in the data set. A DataSet can filter and order items, and convert fields of items. DataView. A filtered and/or formatted view on a DataSet. Graph2d. Plot data on a timeline with lines or barcharts. Graph3d. Display data in a three dimensional graph. Network. Display a network (force directed graph) with nodes and edges. Timeline. Display different types of data on a timeline. The vis.js library was initially developed by Almende B.V.
Or download the library from the github project: https://github.com/almende/vis.git. 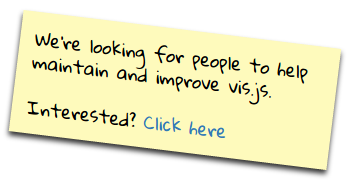 or load vis.js using require.js. Note that vis.css must be loaded too. Where container is an HTML element, data is an Array with data or a DataSet, and options is an optional object with configuration options for the component. A basic example on loading a Timeline is shown below. More examples can be found in the examples directory of the project. The source code uses the module style of node (require and module.exports) to organize dependencies. To install all dependencies and build the library, run npm install in the root of the project. The folder dist contains bundled versions of vis.js for direct use in the browser. These bundles contain all the visualizations and include external dependencies such as hammer.js and moment.js. The source code of vis.js consists of commonjs modules, which makes it possible to create custom bundles using tools like Browserify or Webpack. This can be bundling just one visualization like the Timeline, or bundling vis.js as part of your own browserified web application. Note that hammer.js version 2 is required as of v4. You can integrate e.g. the timeline component directly in you webpack build. Therefor you can e.g. import the component-files from root direcory (starting with "index-"). There is also an demo-project showing the integration of vis.js using webpack. Vis.js may be distributed under either license.